The Samsung Galaxy Note 8 presentation kicked off in New York yesterday (23/08/17) and it kicked off in style! A 3-screened stage (two walls and a floor) made for a rather fantastic 3D visual display. Showcasing the new Note 8’s design in a fun and inventive way. Initially, before any speaker took the stage Samsung had a short presentation regarding and acknowledging the failure that was the Galaxy Note 7. It was the company’s way of apologising for their mistakes and thanking the loyal fans of the Note series that either downgraded to the Note 6 or sat patiently in anticipation for the Note 8 to take the stage. It was a highly televised and highly publicised event when the Galaxy Note 7 was recalled due to its exploding battery concern. This was a pivotal point in Samsung’s Mobile history that could either make or break their future and with the successful launch of the Galaxy S8 earlier in the year and the huge anticipation for the new Note 8, it seems they have held their stance in the mobile market. He then went on to mention why the Note is unlike any other phone on the market today. For one, it’s a phablet, and claims no other company saw the gap in the market between smart phone and tablet and unlike their competition they have utilised this. 74% of people agreed it was their personal best phone ever owned. Enter Justin Dension, Senior Vice President of Product Strategy. Mr Denison spoke largely about what the phone can do and new features we can expect to see from the Note 8. It is set to feature the same infinity display unveiled with its little brother the Galaxy S8 to make for a seamless “cinematic experience” on it’s much larger, 6.3inch, screen. Denison continuously mentioned this multi-tasking feature and that the Note has always been a phone made for a multitasking audience. Though it isn’t a new feature the multi-window feature was mentioned in an effort to showcase a new feature, the app pair feature. This allows the user to join two programs together that are frequently used in conjunction with one another. It seems a bit of a niche feature, but for those that do use this function, it certainly shortens the process. Following on from Denison, Suzanne De Silva entered the stage, a director of product marketing at Samsung. De Silva showcased the Galaxy Note 8’s camera and s-pen features. The 12MP dual camera has a dual pixel sensor that allows for the camera to capture moments in low light. It also now has a quick launch feature and a camera that is raved to be literally twice as good as the last. Both camera lenses, the wide-angle and telephoto will come with optical image stabilisation. There also was mention of a ‘live focus mode’ that allows photos to be edited during and after capturing dependent on where you wish the focus and subject of your photo to be. The multiple lenses also take two shots of each photo. One of a wide-angle shot and one with a focused and increased pixel telephoto lens image. The screen, whilst showcasing the camera features, showed a label of ‘Bixby vision’ that seemed could be selected. 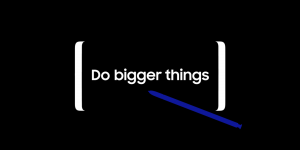 I presume this goes on the feature that Bixby can identify landmarks, products, brands etc in the way that was described for the S8 – however as it wasn’t touched upon in the presentation it is, as I say, a presumption. The S-Pen has been edited, but doesn’t appear to have changed hugely. A finer tip and increased pressure sensor is set to make it more accurate than before, but this seems to be the only alterations. An interesting and rather helpful feature seems to be that the note taking function can be placed to be always on display and is editable from the lock screen by a simple double tap. This again adds to this multitasking feature Samsung were selling so heavily. It has also been given a translate feature, that allows you to translate entire sentences with the touch of the pen as well as convert measurements and currency with a single touch. From De Silva to Jon Wong, Samsung went on to showcase the Bixby AI and Samsung Dex features. I must admit, I wasn’t overly impressed with the Dex presentation for the S8, it seemed somewhat gimmicky and for the extra cost, irrelevant. However, this time, Wong showcased Samsung Dex in a way that seemed multi-purposeful and as though your phone carried both work and home life wherever you go with your Dex. He began editing on his phone and after placing the Note 8 onto the Dex pad logged straight in and was able to continue the same project on the desktop seamlessly. This was the intention with the Dex for S8 but the presentation this time demonstrated that feature in a far more impressive manner. Bixby was raved during the S8 presentation to be the smartest AI of smartphones yet, though took a massive 4 months before it rolled out to devices globally. So it’s safe to say that expectations are high. The acclaimed Bixby is able to adapt to your voice, jargon and colloquialisms and learns based on the way you use your phone. As a current owner of an iPhone, I must say it has more appeal to me currently than Siri, whom I don’t particularly bother to use. Samsung are also introducing a quick command feature that can be set up within Bixby. Wong displayed this by selecting the Bixby function and stating the phrase ‘food photo’. Bixby instantly opened up the camera, with customised settings and focus as well as then saving the photo to a specific ‘foodie’ album. All by stating a two-word phrase. To further emphasise this, Wong also said the phrase ‘Good Night’. To which Bixby set the phone to Do Not Disturb mode, set the morning alarm and turned the light to ‘blue light mode’ as a person would manually for their pre-bedtime ritual. Wong stated that the “Note 8 redefines what our phones can be and how we use them in our daily lives”. The presentation finished off with a return from Senior Vice President, Justin Denison who mentioned the increased security options for every user’s preference. These included the all new iris and facial recognition scanning as well as fingerprint, pattern, code and password locks, giving a security option for all. With the ever growing threat of cyber-attacks, physical theft and a nearing GDPR deadline – the 10 point knox defence grade security system puts this to rest. He also mentioned, as similar to the Galaxy S8, that the Note 8 will come with a set of free premium AKG earphones and a small dig at Apple for their foolish removal of the headphone jack by simply stating the Note 8 has a headphone jack and will continue to have a headphone jack.